Dual Ball Bearing "GT30/GT40R" Turbo assembly. T3 style inlet flange with 4 bolt T31 style exit. This turbo incorporates the same exact GT40 compressor wheel found in the popular GT35/40R, but runs the smaller 60mm w/84 trim turbine wheel from the GT30R. Appropriate for smaller engine where the GT35/40R feels too big, but the high amount of compressor flow is needed for the desired HP and boost levels. Large T04S style compressor housing with 4.00 inlet and 2.50" outlet. 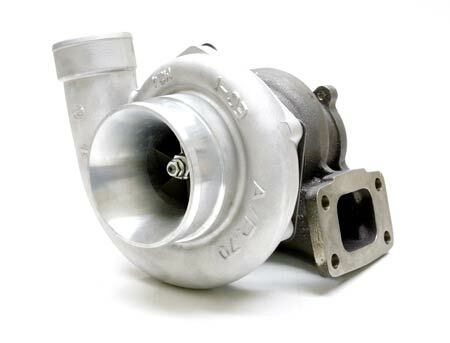 This turbo has a flow capacity of about 600HP.